Gallery walls are hard to get right. I’ve hung photos in galleries before and it can be a flipping nightmare to get right if you don’t have some sort of a plan. 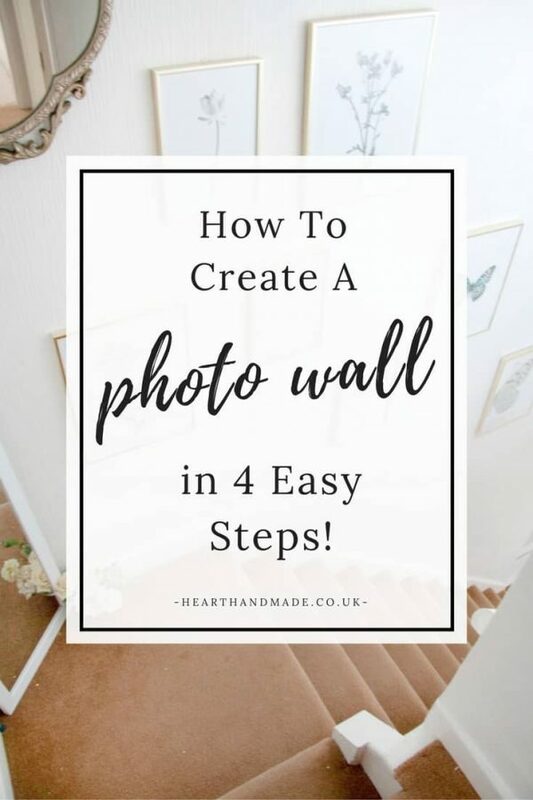 Armed with a plan and amazing prints and frames, I decided to create one and then teach you how to create a photo wall in 4 easy steps! 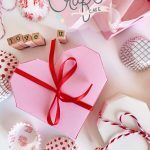 Have you been searching for ideas and inspiration on Pinterest but just haven’t gotten around to even thinking about planning one? Yeah, that was me too until I moved into a new house this year and the walls were sparse, to say the least. I was excited when I discovered a site called Desinio where I could purchase large Botanical prints and beautiful frames. A small gallery wall looks great in the hallway, but I have got a huge open ceiling, so I was happy to hang a few large photos. 1. When making a gallery wall, it can seem as if it’s a massive undertaking. My top advice is to have a plan before you hammer the first nail in the wall. 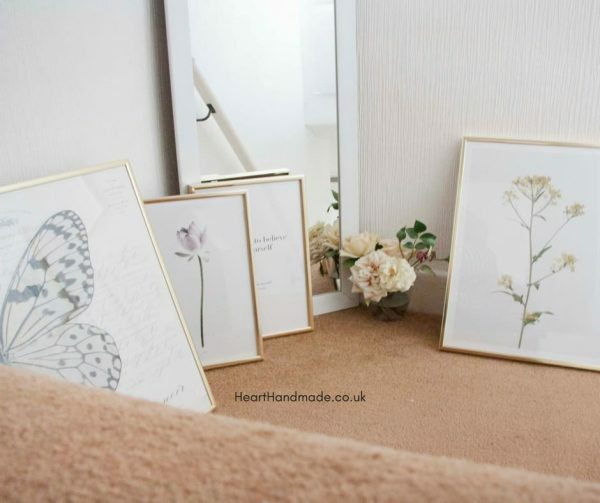 Lay the pictures out on the floor and combine them until you find a pattern that you like, or use washi tape to temporarily mount your pictures on the wall. You can also use the inserts of the frames on the wall, so you know where to poke the nail or pin. The frames from Desenio are really light weight, so I was able to use drawing pins. 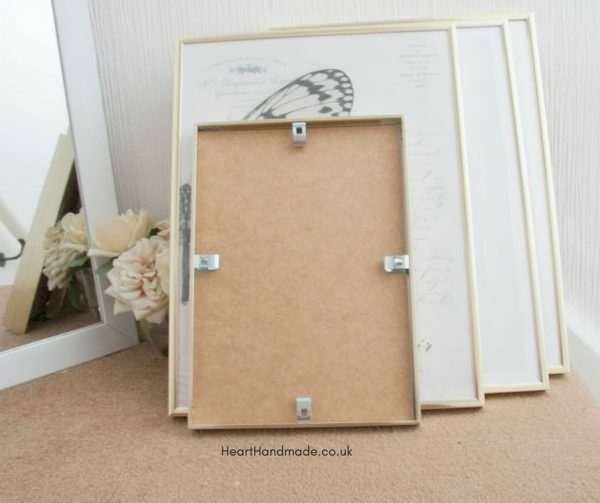 Desenio frames also have these wonderful bouncy secure clips at the back which double up as a picture hanging bracket. 2. Always start by hanging the largest piece first. Use a spirit level to hang them evenly. 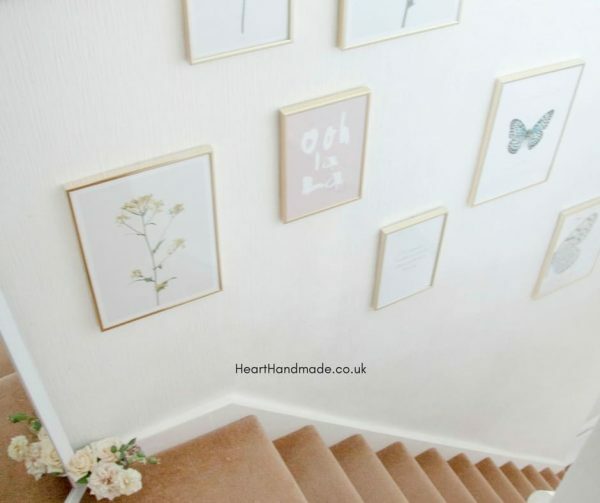 If you are going to mount the pictures above a piece of furniture, make sure you centre the arrangement according to the width of the furniture and not the wall itself. Pay attention to ceiling lines. The ceiling lines in my house are wonky as all heck. Make sure you measure from the ceiling. Step back and make sure everything looks right. Don’t simply go off of a level, use both techniques. 3. Another tip for mounting posters is to adjust the space between the pictures depending on the size of the room. A smaller room can feel more spacious with less space between the pictures. 4. Use a mix of sizes and the pictures should match the style and colour scheme of the room. 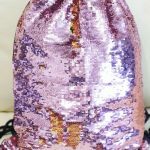 Ensure that you have one large print that becomes the focal point. I have white walls, so I chose to go with pink/white and gold as my colour scheme. 2-3 different colours are usually enough to avoid a busy look. 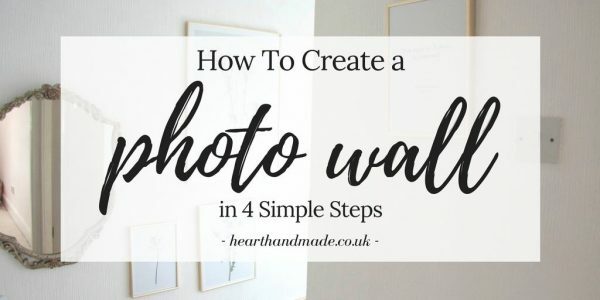 There are so many different ways to hang a photo wall, and if you love it, that’s all that really matters. I love my gallery/photo wall! 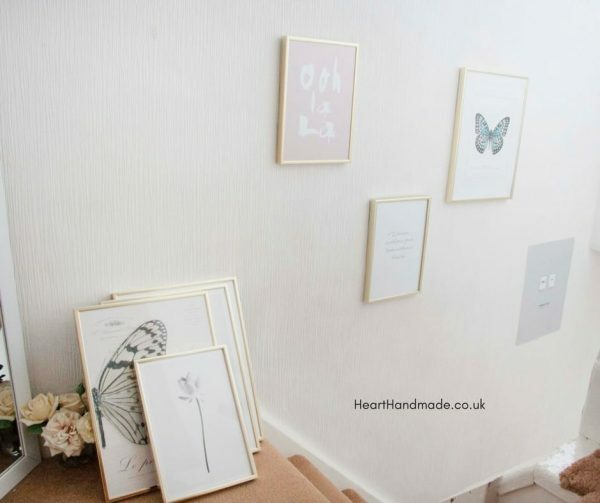 Have you had any experience in hanging a photo wall? Has it been a nightmare? I imagine it can be if you don’t have a plan but seriously, if you follow these four steps you can’t go far wrong. There’s a great tip in the comment section below about using Command Strips, which I highly recommend but our wallpaper didn’t like the weight of the frame and pulled away from the wall. It’s a great idea for painted walls though! You can also find some rather fabulous art and frames from Wayfair. 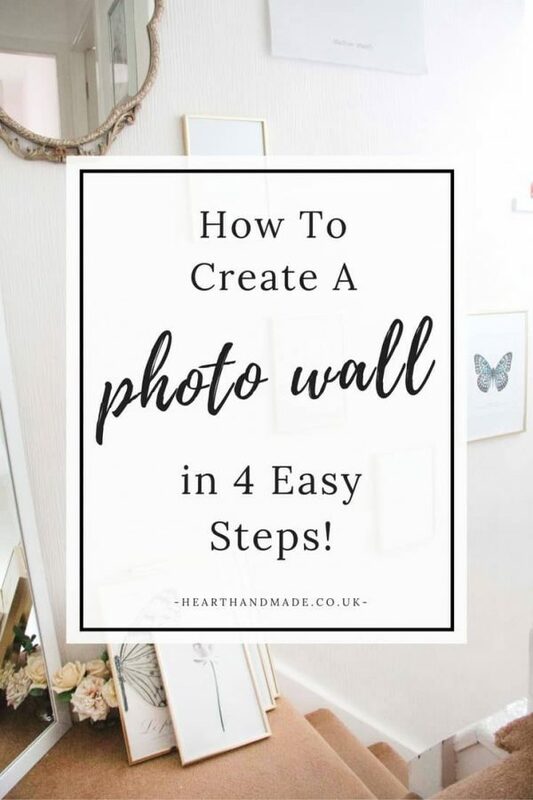 I hope you have actually learnt how to hang a photo wall and you can translate these tips into an actionable plan to hang your very own fabulous photo wall! I love your botanical prints! I saw a great tip on another blog for using command strips for having a gallery wall because you don’t have to worry about correctly positioning your hooks. It also means you can easily change what you have on the wall without leaving holes.